It has been a long while since I wrote a blog about New York Times columnist David Brooks. Today’s NYT (Feb. 27) has a wonderful column, worth summarizing. 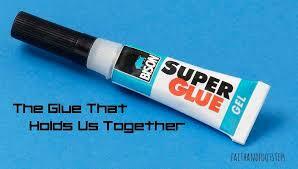 The subject: What glues people together? And, based on this – what would a ‘moderate’ political agenda look like, neither extreme right nor extreme left? In these days of vitriolic polarized toxic politics — moderate agendas seem either bland or non-existent. Here are Brooks’ four key elements of a moderate agenda – policies that bring us together. The four super-glue elements that bind us together are: our children, our work, our communities, and our shared humanity. Our work: “Help people find vocations in which they can serve their communities”. Our communities: “devolve power out of Washington (or your country’s capital city) to the local level”. All politics is local, it is said. But it is not. We can make it so. Our shared humanity: Let’s care about the elderly, the disabled, migrants, the ill, minorities…. People are basically good. Reject those who think and act otherwise. Reject politicians who seek power by appealing to base motives. Look for those who espouse good. Can ‘left’ and ‘right’ unite under these ideas? Can this ‘center’ bring us together? 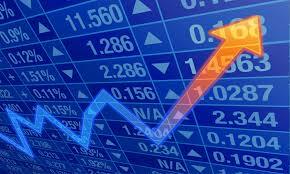 The New York Times reports: “The US stock market is off to its best start (of the year) since 1987”. Good news? And then the bad news….”investors are expected to dump hundreds of billions of dollars of shares this year.” Bad news. So what in the world is going on? The article, by Matt Phillips ,has an uncharacteristically clear, simple explanation. Remember that Trump tax cut? The one that put billions of dollars into the pockets of the wealthy and the corporations? Well it made the corporaitons cash flush. What did they do with the cash? Invest it, in infrastructure, R&D, innovation? They mostly used it to buy back their own shares, massively. Why? Simply – to funnel that big tax cut directly into the pockets of shareholders, at low (capital gains) tax rates. Share buy back by corporations drove the market up. Even at a time when armchair investors, funds, etc…. were selling. Investors aren’t dumb. They will take their profits, before the market crumbles when the buy backs of corporations stop. I avoid the stock market. But for those who want to listen, I counsel, don’t hold shares of businesses that buy back their own shares. Why? If the best investment businesses can make, is buying back their own shares, rather than developing new and better products, well — dump them. Share buy backs are abysmal. They are caused by CEO’s seeking to look good, in the short years they hold the position, under pressure of myopic shareholders and Boards. Share buy backs have now cemented corporations as the leading source of demand for shares – their own. This is a fundamental change in the way the stock market works. It is a change for the worse. When companies STOP buying back their own shares, they will pull the rug out from under the market. This will happen, perhaps, when the US enters recession – something most economists expect to happen by 2021. 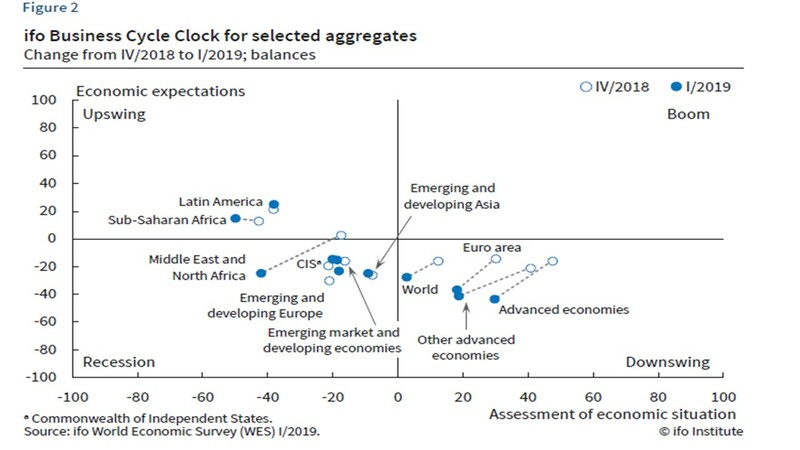 The graph above shows on the x axis, “assessment of the current economic situation” and on the y axis, “economic expectations” (how you think the economy will trend in the coming 6 months). The worst outcome is: the ‘dot’ moves south west (i.e. the economy is declining, and it will continue to decline in the near future). Ifo Munich gathers data on the world economy, by region, by a survey of experts. 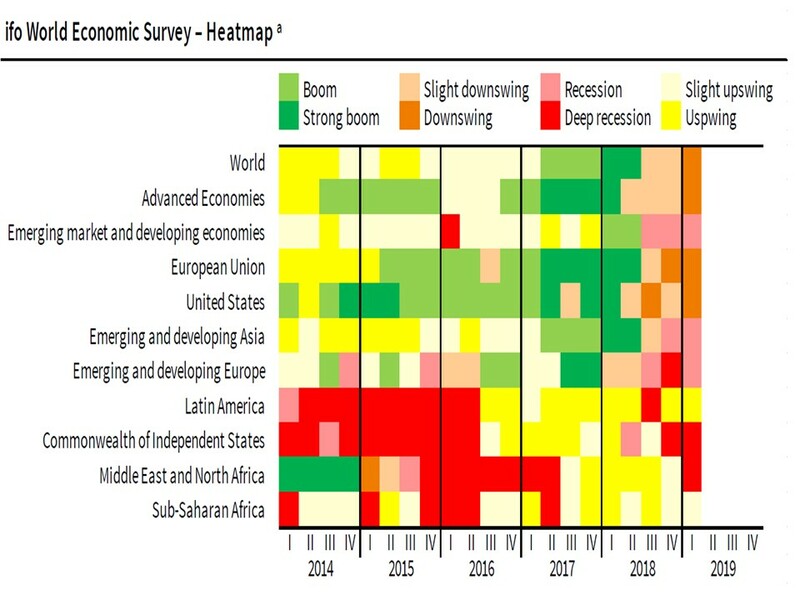 Look closely at the graph –the “world economy” moves strongly south west. So do the Euro area and advanced economies. Same for Mideast and North Africa. Nowhere does any economy move other than west (down). Why? How about – US -China trade war, global uncertainty, Brexit, EU disunity, and…. The list is long. We can blame part of this on Trump. He has thrown a monkey wrench into the world trading system, introduced massive uncertainty….and the world economy has cooled. When the two largest economies in the world, US and China, AND Europe, all cool at once…. We are in trouble. Fasten your seat belts. It will get worse before it gets better. About 2.1 billion years ago, a blob-like creature inched along on an early Earth. As the organism moved, it carved out tunnels, which may be the earliest evidence of a moving critter on the planet. 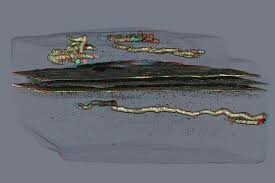 Until this discovery, the earliest evidence of motility — that is, an organism’s ability to move independently using its own metabolic energy — dated to about 570 million years ago, according to fossils from different locations. That’s a good 1.5 billion years younger than the new finding. Here is why I find this so amazing. We humans have been on this earth, more or less as we are now, for only about 50,000 years. But that blink of an eye was preceded by 2.1 billion years of evolution, starting with ‘blob like creatures inching along” and evolving, through natural selection, patiently, inexorably, into what we are today. From one cell, to multi-cell, to fish, to mammals, to us…. With infinite step by step patience. Many religious people take issue with this view of Creation. I find that it strengthens belief in a Divine Creator, rather than weakens it. What an incredibly brilliant, patient, focused system, evolution, able to generate divinely-inspired human beings and patiently take its time doing so, for 2 billion years. I wonder whether this system of evolution, constantly improving species and races, has come to an end for humans. Are we improving, evolutionarily, or are we degrading? Our Two Brains – The REAL Deal! On the latest Hidden Brain podcast, by Shankar Vedanta, the guest is a psychiatrist and brain researcher, Iain McGilchrist. 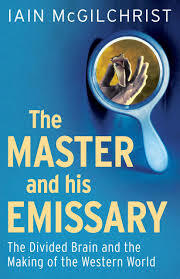 He speaks about his new book The Master and his Emissary. I plan to read it very soon. There is enormous misleading hype about the left and right brains. Much of it is wrong. McGilchrist’s book is the real deal, and helps us understand our world. The title comes from out an old folk tale. A “master” sends out an emissary to the countryside to gather information. The emissary gathers vast information, and tries to become the master, based on the knowledge he collected. But he cannot. He fails. Because he has only facts, details (left brain/logic), and lacks big picture capability (right brain/holistic thinking). Evolution helped humans survive. To kill and eat prey, we need right-brain big-picture thinking (the forest, trees, rocks, weather, etc.) and crucially need small-picture detailed left brain thinking (the deer is 20 yards to the left of the oak tree and is limping). Of course, most crucial of all is the connecting link between the right and left brain. Weird things happen, McGilchrist explains, when surgery has to sever the nerve path connecting the two brain hemispheres. There is a serious message in the book, way beyond the research findings. 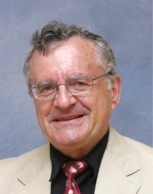 McGilchrist argues that increasingly we live in a left-brain logic driven world, based on algorithms and small details. And on short run optimization. What’s best for now. I believe our political system is mainly driven by left brain messages. Note, especially, that the emotion ‘hatred’ and ‘anger’ are actually cross-brain, not solely right brain (where most emotions originate), Many political messages are now focused on hatred, left-brain hatred. “Meaning comes out of having consistent pictures of the world,” McGilchrist told Vedanta, based on knowing our past, not just our own but that of the world, the past of others.” A more right-brain world will focus on the long run, on the big picture, and on our interaction with our planet and with Nature. Now, how in the world do we achieve that? A start, at least, is being aware that there is a right/left brain problem in the world.